Built for the will of Ferdinando IV di Borbone in the semicircle of the famous Piazza del Plebiscito, it was started in 1816 and completed around 1836 based on a project of Pietro Bianchi. 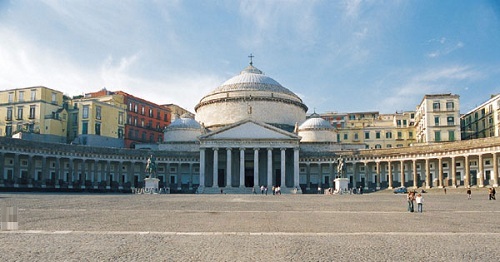 The basilica is placed in the center of the neoclassical colonnade, previously built by Gioacchino Murat. The façade is preceded by the pronaos that is surmounted by a triangular tympanum with three statues at its vertex. The church has a cupola ceiling: a central one 53 mts in height and two side ones of smaller dimensions. 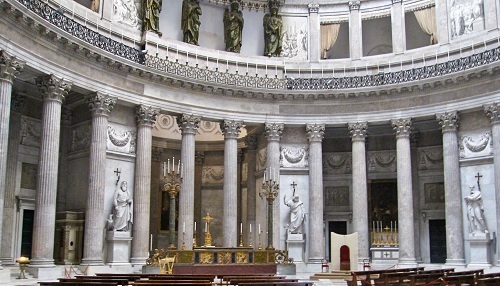 The church’s inside has marble floors with geometrical designs and a circular colonnade made of 34 columns of Corinthian order, that sustain the grand coffered cupola. Inside you can admire the paintings of Luca Giordano, Pietro Benvenuti, Tommaso De Vivo, statues resembling Saints, and the splendid main altar from the Chiesa dei SS. Apostoli, decorated with precious stones.